Myriad used our experience with over a million patients tested to further optimize Myriad myRisk® testing with next generation sequencing (NGS). NGS allows for rapid sequencing of multiple genes concurrently. In the largest validation study of its kind, Myriad estimated analytical sensitivity of greater than 99.92% with 100% concordance on NGS/Sanger parallel sequencing in all genes in the Myriad myRisk panel and 100% concordance on large rearrangement validation. Myriad myRisk’s gold standard NGS technology serves as only one part of the many steps that Myriad pursues to ensure the highest quality and sensitivity for every sample that is submitted. The following cycle shows the extensive laboratory process from DNA extraction and sequencing to laboratory director approved reports. 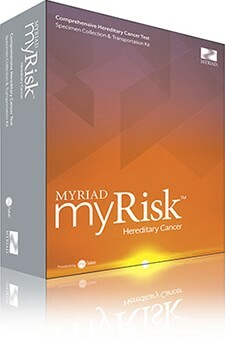 Over 20 years, Myriad has conducted over a million tests for hereditary cancer. Myriad is the unquestioned industry leader in variant classification and reclassification. myVision™ is the most advanced program in the industry overseeing the classification and reclassification of uncertain variants and is part of Myriad’s commitment to patients and their families that lasts a lifetime. WITH more than 20 years of experience, 1 million patients’ lives affected WITH A RESULT, AND over 65,000 testing providers, MYRIAD IS THE WORLD LEADER IN HEREDITARY CENTER TESTING. We are here to help you implement Myriad myRisk® into your practice.